Walt Disney’s first full-feature animated film “Snow White and the Seven Dwarfs,” directed by David Hand, may be too simple in story and animation when it comes to today’s standards but that was what I loved about it. An evil queen (Lucille La Verne) decided to kill her step-daughter named Snow White (Adriana Caselotti) because the Magic Mirror (Moroni Olsen) claimed that the queen was no longer the fairest in the land. The queen sent a man to kill her step-daughter but he instead let her escape because he couldn’t find it in himself to commit murder. 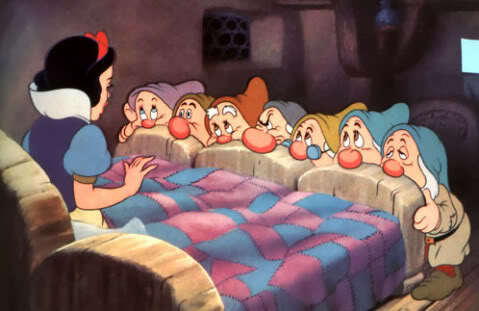 Snow White then ran away to the forest and there she met the seven dwarfs with very distinct personalities. Most of this picture was pretty much singing and dancing, while the story could only be found in the beginning and the final showdown between good and evil. While I did think that Snow White was not a very smart character in particular (who decides to eat a random apple that came from a shifty stranger? ), she was likable enough for me to ultimately root for her. And although the lesson in the film was questionable because it pretty much implied that women should be good at cleaning the house, washing clothes, cooking and depending on men to rescue them from a sad situation, kids should nonetheless be entertained because of the sheer amount of vivid colors and energy that the film had all the way through. Not to mention the songs were really catchy, especially “Heigh-Ho” and “Some Day My Prince Will Come.” It must be noted that this animated film explored a little bit of darkness that might scare the children. Some examples include the queen’s determination to kill Snow White in not-so-subtle ways such as cutting off her heart and poisoning her with an apple, the witchcraft and transformation scenes of the evil queen to a decrepit old lady, and the nightmarish experience that Snow White had when she ran into the forest. Yet, in a way, I was glad that those elements from the fairy tales of Wilhelm Grimm and Jacob Grimm, from which the picture was based on, remained intact because it kept me engaged, which meant that the older viewers would most likely not get bored by the repetitive singing and dancing. The great artistic endeavor that was “Snow White and the Seven Dwarfs” opened the door to so many of Disney’s most excellent animated features. Although the film had its flaws, I believe we must honor it not only because it was progressive but also due to the fact that it provided people laughter and hope during the Great Depression.